CAD application Revit is developed by Autodesk and used within AEC industry where 3D-design and visualization is important. Revit is used by many stakeholders within project for architects and operation as well as maintenance. Revit is used as a platform for 3D aspect of BIM and is therefor the main platform whose focus is on geometry. In recent years more complete data information has been added into 3D model within Revit and in pace with project drawings are extracted from the 3D model during design phase which makes information unaccessible. 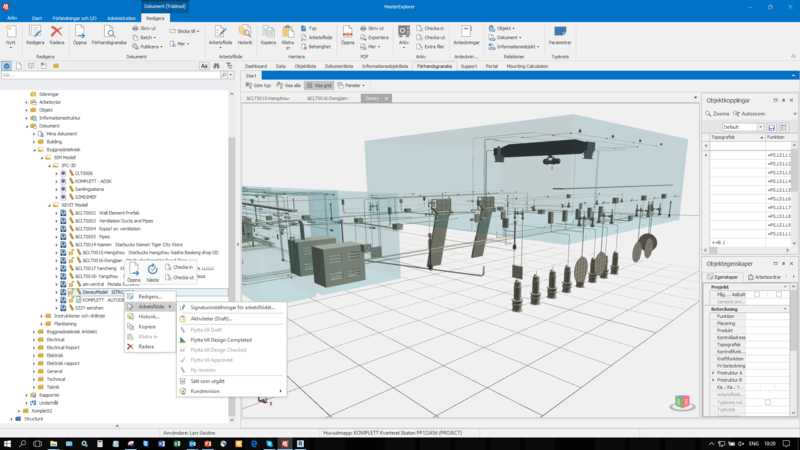 MasterConcept for Revit is a supportive platform for extracted 2D documents and 3D models and it can create objects from Revit 3D instances for further modelling outside 3D model. And information is still accessible for those who don’t have Revit thanks to ides MasterConcept applications and their common object oriented data models. When 3D process is finished, it will generate a large amount of work document that will be used in contracts like plan and sections drawings as well as installation documentation. MasterConcept for Revit helps picking up generated files and tracking these document with revision and version management. Besides, MasterConcept has connected same instances in 3D models with object in MasterConcept for further process and lifecycle management. Managing exported drawing files in AutoCAD or PDF format. Document management for Revit is important when producing a lot of documentation from a 3D model. The 3D model is used by workgroups which include a great number of users. Thus, safety and protection of complex files are essential. Managing documents and drawings during the project is an important task and it is important to know the status of each document in every step. For example if the document is approved or just a draft copy. Therefore, it is important that document control mechanism works both for Revit sheets and for the entire 3D model. Users get support with revision management for 3D model in MasterConcept in order to obtain full traceability and back up. MasterConcept even supports work group to work with Revit model. Document management supports central models’ check-in and out and local work copies that should be synchronised later. In MasterConcept CAD-Driver for Revit users can choose to export Revit’s views directly to AutoCAD or Acrobat PDF formats. Users can set up export function in list-view in CAD-Driver for all sheets and views. The automatic document exporter is then started and exports all documents. 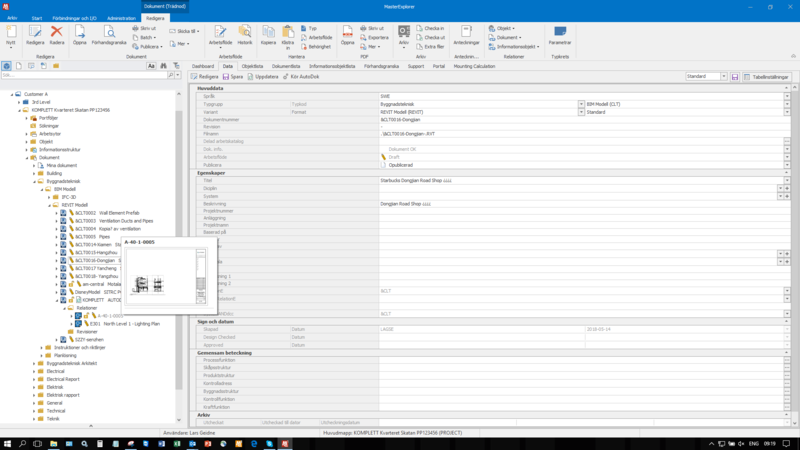 MasterConcept will then receive all export files from Revit and put them in an import-basket and then check them in one-by-one into MasterConcept with related document number information by revision management. If the drawing is already approved earlier and users need to export a new revision, MasterConcept will enumerate for next revision. Users can even look on previous revisions of same drawing. Everything will be saved. There are many members involves in a project both external and internal. Document management controls revisions for you with MasterConcept for Revit. Let us use doors in Revit as one example to explain what your team can accomplish by connecting MasterConcept to your Revit application. With assistance by MasterConcept users can identify all doors (or any kind of graphical instance) or the amount of ventilation ducts in 3D model. 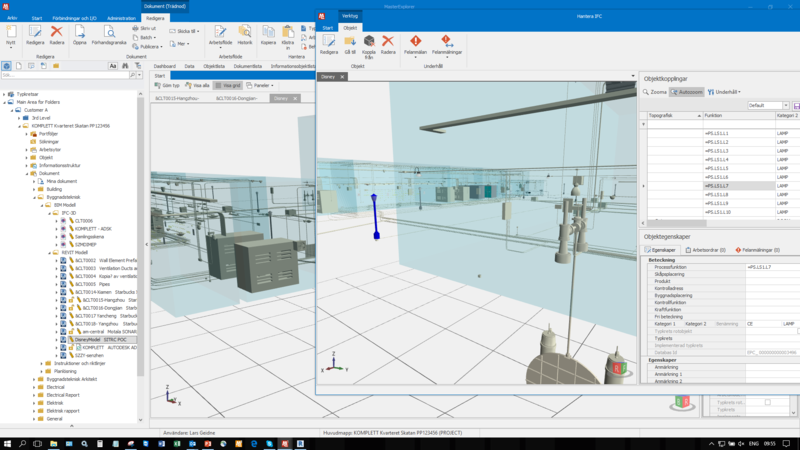 MasterConcept create objects from each inserted object such as door and window in 3D model so that they can identified outside Revit. Team can then make volume calculations, cost calculations and cost analyzes in a simple way in MasterConcept. Besides, it is possible to add properties to each door and select a supplier or manufacturer for it and get the As-Built information at any time. There are important data /properties on 3D instance or “family” in Revit that are called parameters. Parameters can be synchronized with object properties in MasterConcept and those who belong to familjen/symbol in Revit can either be read only or dynamic. It means that users are able to fill with dynamic parameters outside of Revit and then update them in Revit. MasterConcept handles all variants. In some cases other organisations ( purchase, project management )who can’t access Revit also need to access information in MasterConcept because MasterConcept has created correspoding object or often more objects than those who exist in Revit. To find out where a object is located, users can use MasterConcept’s built-in preview application. MasterConcept makes documents and 3D models transparent, which helps users to find out where the object is drawed (3D model or AutoCAD). It also gives users support with relations to other documents and which type of equipment or suppliers’ artikel nummer they are using. 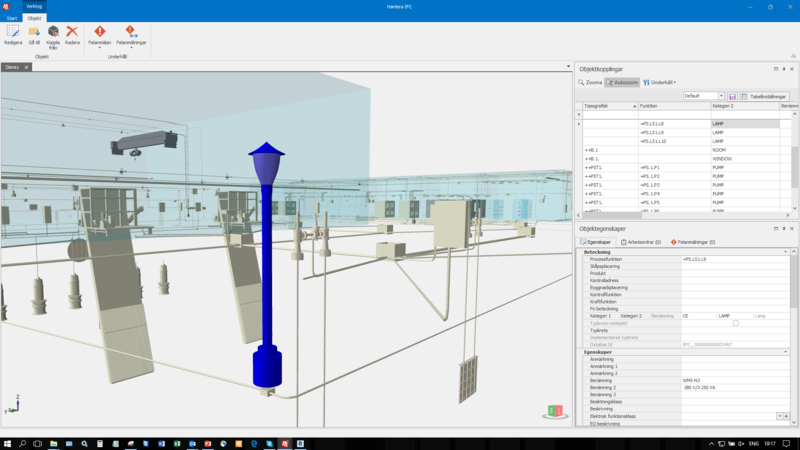 Management group will now be able to use 3D model to find out equipment’s location and typ of equipment with associated technical data in property. Architect is responsible for building and others fill the building with information. It is electrical design with switchgear, circuit breakers and ventilation systems and even ventilation with air cooling or heating. This means that many documents will be produced and in the end someone shall manage the building. The first step for managing is to assess quantity and a certain variety of reserv parts meanwhile providing maintenance instructions. With MasterConcept, property management can keep track of property documentation. With MasterConcept maintenance module, complete maintenance routines can be developed at an early stage. The management can now find out what the property contains – typ of equipment, which documents describe them and what maintenance routines to use. Using IFC view function included in MasterConcept so that all shall access to 3D model. Fast and easy to update view-files only with a simple button push. Use MasterConcept Cable Routing-applikation to find ut cable’s location and quantity. Drawing cable routes easily in Revit and creating segments and nodes for your 3D cable ladder.